Kale is a superstar even among superfoods, one of the most nutritious veggies you can eat. Packed with vitamins and antioxidants, it also boasts anti-inflammatory and anti-cancer properties, provides cardiovascular and digestive system support, helps keep our eyes and bones healthy, and plays an important role in the body’s detoxification processes. Happily, kale also tastes great, especially when it’s part of the delicious and inventive recipes in Kale, Glorious Kale, the latest book from bestselling cookbook author Catherine Walthers. Whether you enjoy kale raw or cooked, sautéed or grilled, massaged for a salad or baked into chips, you’ll quickly find that it is amazingly versatile, easy to cook with, and pairs beautifully with many other ingredients and flavors. 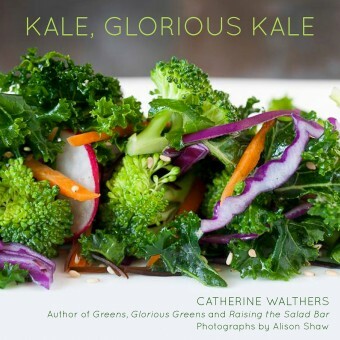 Now, with the guidance of Catherine Walthers, author of Greens, Glorious Greens, and the stunning photography of Alison Shaw, everyone can explore the multitude of ways to make delectable and satisfying meals featuring kale. With recipes like Baked Eggs Over Kale; Kale Granola; Rustic Kale and Goat Cheese Tart; Penne with Kale, Sausage, and Mushrooms; Chicken Braised with Kale and Cider; even Kale Margaritas and Kale, Pumpkin Seed and Bacon Brittle, Kale, Glorious Kale is your complete guide to cooking with this greatest of green vegetables.